September 14, 2018, 2:28 PM · Lately I've been asking the philosophical question: What makes for a great performance? Over the last month I've had the privilege of watching quite a lot of amazing violin playing by some of the most talented young violinists on the current scene, as I've reported live from the Shanghai competition last month and the Indianapolis competition this week. The violinists I've seen have had so many different approaches and so many different stage personas. What tends to make for the best performance, the best connection with the audience? Is it the highly-refined technique that draws us in with that satisfying "right"-sounding music? 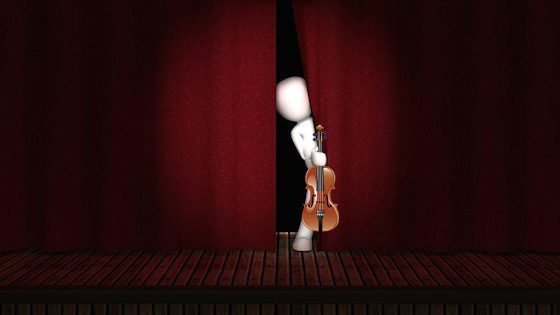 Is it the magic of stage presence, where performer can command an audience before even playing a note? Of course it is a combination, but is it an equal combination, or does generally it lean toward the clean music-making or toward the stage presence? If you think about it, some of the most popular musicians on the planet are not always the top players, yet their performances deeply connect with an audience and attract fans galore. On the other hand, I have been absolutely moved by performances that are simply characterized by glorious music-making, by a performer whose stage presence is not particularly strong. What are your thoughts on the matter? Is one more important than the other, when it comes to the performance stage? How about when it comes to having a career? Please participate in the vote and then share your thoughts in the comments section. September 14, 2018 at 08:52 PM · This is a very difficult question. Both skills are important for soloists, section members not so much although I have seen a few players who have chair behavior that is sometimes distracting. Then there are the players with quirks: Lucia Micarelli plays barefoot, Nadja Salerno-Sonnenberg often cries and dances, many have dynamic movements that are almost signature moves. I'm not sure how that effects the opinion of the audience. There don't seem to be any Glenn Gould equivalents in the string world -- only performing in the studio - never on stage. Andre Rieu's orchestra, while highly skiled, uses the costumes and stage presence to their benefit and draw large audiences. It's a mix. That being said, stage presence will never overcome lack of technical skills. September 15, 2018 at 12:19 AM · The answer is obviously JASCHA HEIFETZ....who was generally void of stage presence....anyone wanna challenge this choice may merely go to youtube and observe/listen to his playing and watch the famed stoicism of his...er...stage presence....and if St Pres is so important perhaps CDs and other recordings are but a portion of a performance ??? September 15, 2018 at 10:54 PM · I just know that the best players seem to invite the audience in as they share the performance; a collective dimension sometimes emerges. "Stage presence" is not a good description for this . . .